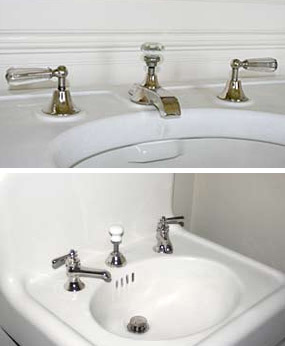 Don’t limit your options in plumbing fixtures to those offered in a catalog. We can work with you to coordinate your finishes to match your preferred selection. Some parts are often not offered in all available finishes. We re-plate trip levers in venetian bronze or oil rubbed bronze or match your faucet manufacturers finish. Finishes do not typically match from manufacturer to manufacturer – to get an exact match it is always recommended that you send a tagged sample with your project.